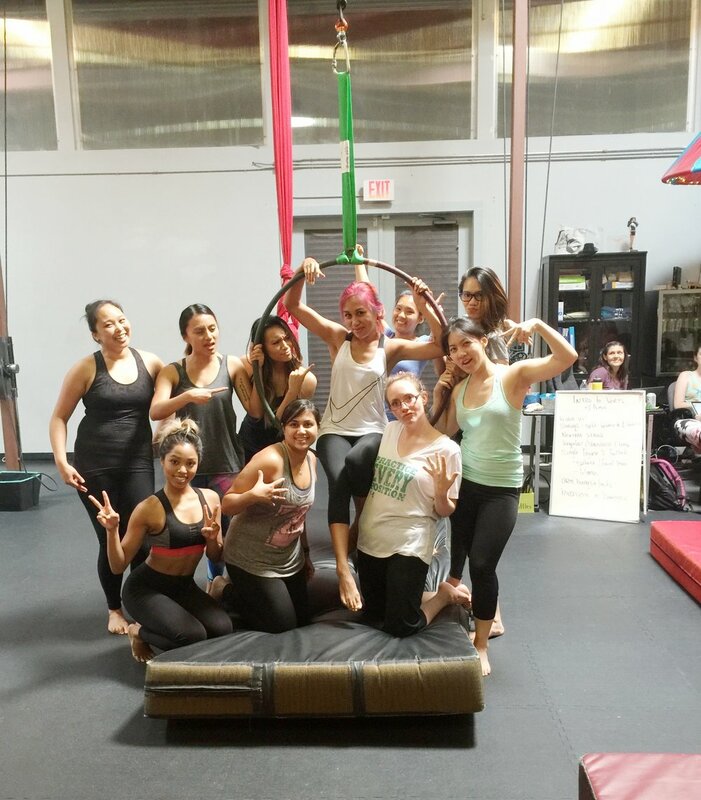 AUSTIN: AERIAL HOOP AND LYRA CLASS! You guys! I had the best time at Sky Candy in Austin! I went with a big Bachelorette Party and we learned how to move our bodies in the air by hanging from silk sheets and hoops attached to the ceiling! When we arrived to the class we started off with a warm-up and stretch. Some of the stretches are similar to my yoga class so I felt pretty comfortable going into the activity. We were instructed to keep our hips forward, something that I work at constantly. I have a little bit of lordosis, which is when your spine is curved like a “c”. Call it a big booty or a little junk in the trunk if you want. But in yoga, we work to keep the spine straight! Anyways, we first started out with an exercise to help us use our range of motion in the neck area. The goal was to keep our head and back straight, arms up grabbing the sheets, legs forward, and then move our upper body up and down using just the shoulders. Next, we were instructed to wrap the sheet around our dominant foot (I’m a right-y!) in a figure eight motion then stand upward. This lifted us up and gave us movement in the air. It felt pretty good, but my hands were a little sore. They gave us rosin for our hands which is a chalky powder to give us grip. It felt like a deep stretch when I let my lower body hang down and make circular motions in the air. My favorite part was spinning on the hoop! Yas, it felt so liberating to spin around on a hoop, I thought I'd never say that. But it's true! I could see this activity being a competition in RuPaul’s Drag Race. Hmmm maybe I have a chance on Las Vegas Boulevard. Nah? Well the best part was using natural momentum to speed up and slow down my rotation. It was quite entertaining and I got out of my comfort zone! 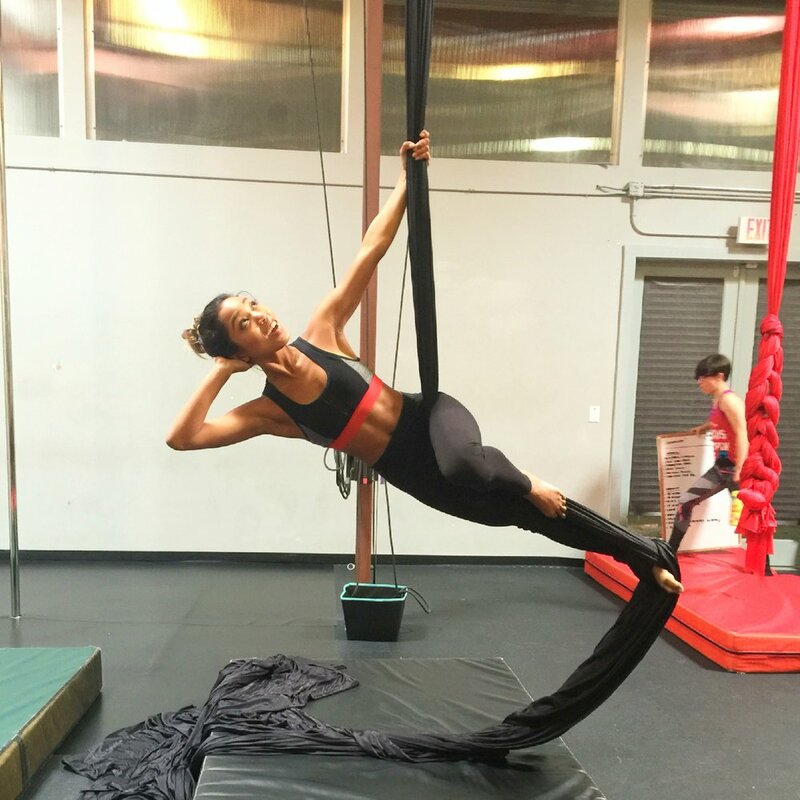 You should give it a go, let your inner acrobat learn some new tricks! If you’re ever in Austin, you must go to Sky Candy!